New: Photobucket has apparently changed it's policy again and is allowing hosting of pictures. Accordingly all my pictures are now available on this thread. Hopefully, Photobucket will continue this policy. are not available. My apologies! Starting on page 55 and forward, my pictures are hosted by Cloudinary, https://cloudinary.com and are visible. Cloudinary is terrific, and I strongly recommend them for hosting your pictures. I started this drone adventure as a test. 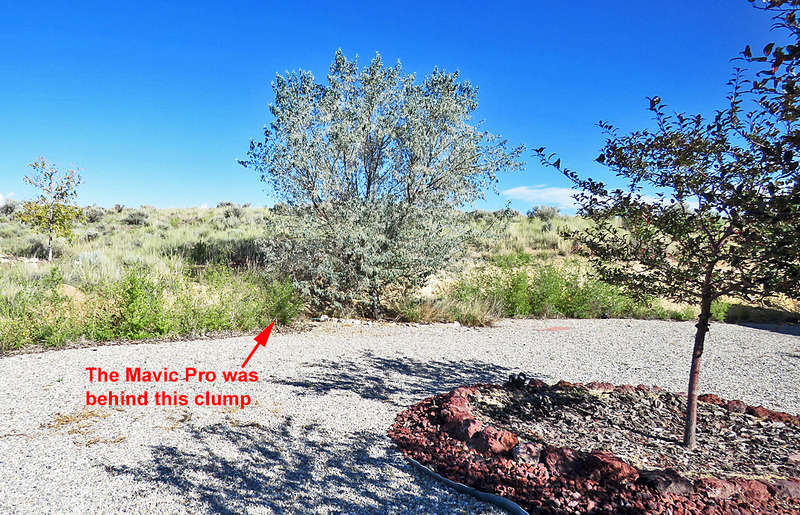 I planned to launch my Mavic Pro from a nearby arroyo, fly it at a height of about 185’ over a ridge to my house. Distance was about 900’. The plan was to land it behind the ridge at my house. The question: could I control the drone once it was behind the ridge? 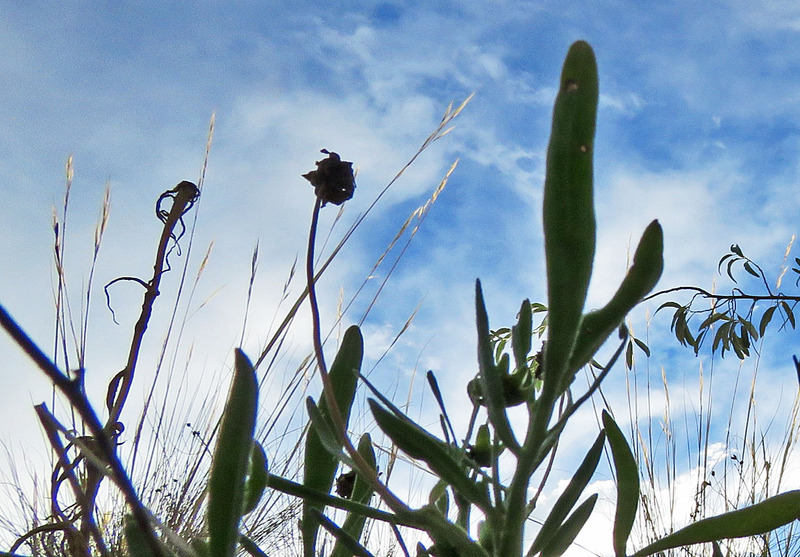 Of course, it didn’t dawn on me, if I could not control the drone behind the ridge, what would happen to the drone? My first try at landing was in tight area between 3 walls. When the Mavic Pro descended to a height of 70’ above the launch, but behind the ridge, I lost control, but, regained control in a few seconds. That should have been the end of the test. I could not control the drone when it was out of sight behind the ridge. But, I persisted. At a height of 150’, I flew it to the back of my house which was more open and again tried to land it. The Mavic descended to about 79’, where I lost control again. This time, I did not miraculously regain control. The Mavic Pro was lost. I was, of course, panicked. I truly had no idea where the Mavic was since the controller had lost touch with the aircraft. I don’t know why, but, starting where I lost control near my garage, I began to walk on a line back toward the launch. Because the drone was still turned on, its lights were on. 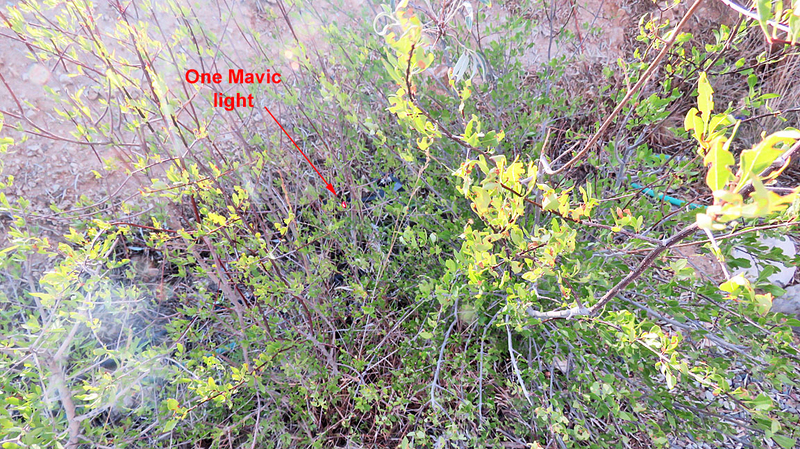 Somehow, I spotted the drone, the drone lights really, on the ground amongst some tall vegetation at the edge of my graveled drive way. Looking at the flight log, it is clear what happened. Flight log? Yes, there is a flight log of that whole flight. How DJI, the designer and manufacturer of the Mavic Pro, does that when you have lost controller contact with the drone, is beyond my pay grade. When I lost control of the drone the second time, the drone decided it had to take things into its own hands and head back to the launch (home). 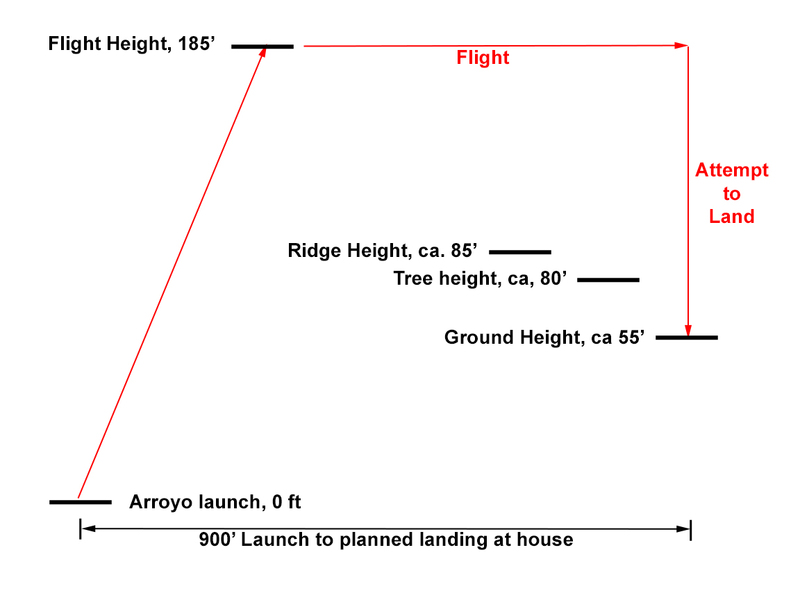 It ascended to 97’ (standard) and headed directly to the launch site. At this altitude, it should have cleared everything and returned to home. For whatever reason, maybe the controller regained control, it lowered its altitude to 75', collided with tree branches, and tumbled to the ground upside down but still on. Of course, the propellers had turned off. 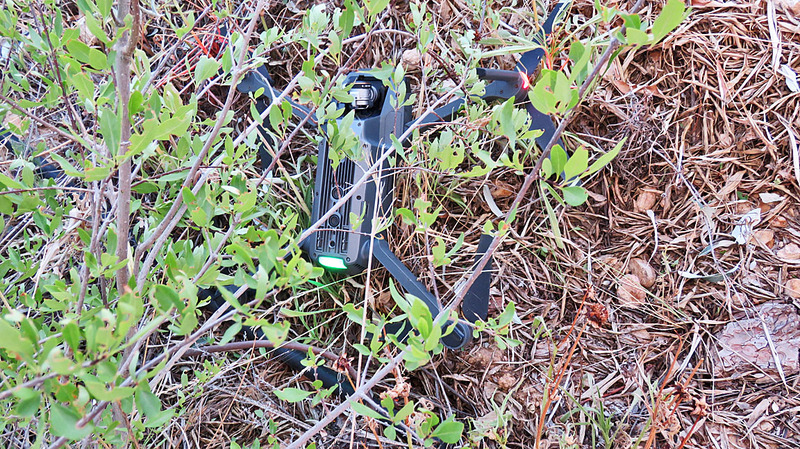 A most important lesson learned: always have a direct line of sight to your drone. Your drone may be too far away to see, but there must be a direct line without solid obstacles between the Mavic Pro and its controller. Of course, it says that in the owner’s manual, but I think I was pushing the envelope and went a bit too far. Kudos to DJI for building a quadcopter, the Mavic Pro, strong enough to stand the abuse which I have given it. I hope my learning period is over! Last edited by Chekika on Thu May 17, 2018 11:02 am, edited 5 times in total. Wow, Bob, that sounds pretty scary from your drone's viewpoint. I haven't had any problems like that, but have not flown much in the last week--too much company! You haven't posted any pictures yet. You are still up in Maine? If you have never been out in the “4-Corners” area, i.e., the corner made up of the intersection of the borders of Colorado, New Mexico, Arizona, and Utah, you are missing something. 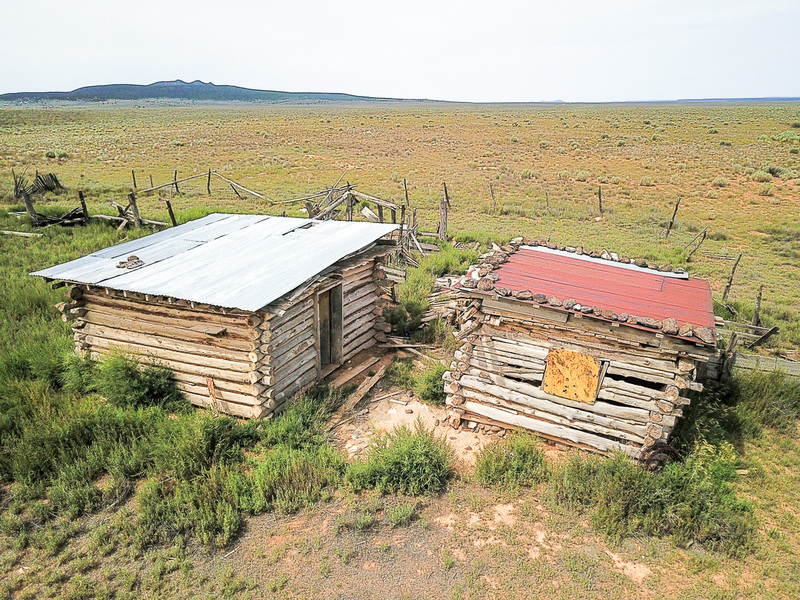 I’m only going to show you a few houses from around Taos, NM, which is approximately in north central NM, just 50 mi south of the Colorado border and 200 mi east of the 4-Corners area, as the crow flies. 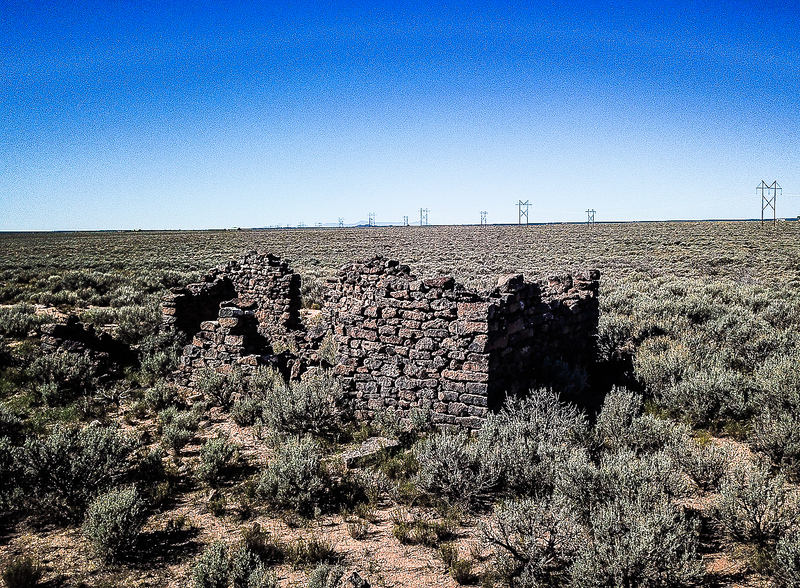 This is an abandoned homestead, west of Taos. I have no idea when it was last occupied, probably 50-70 years ago. This is a deteriorated rock house. My guess is it was quite cold in the winter time when temperatures get down into the Fahrenheit teens and lower. Roughly half the stones are gone, presumably used where they were needed more. 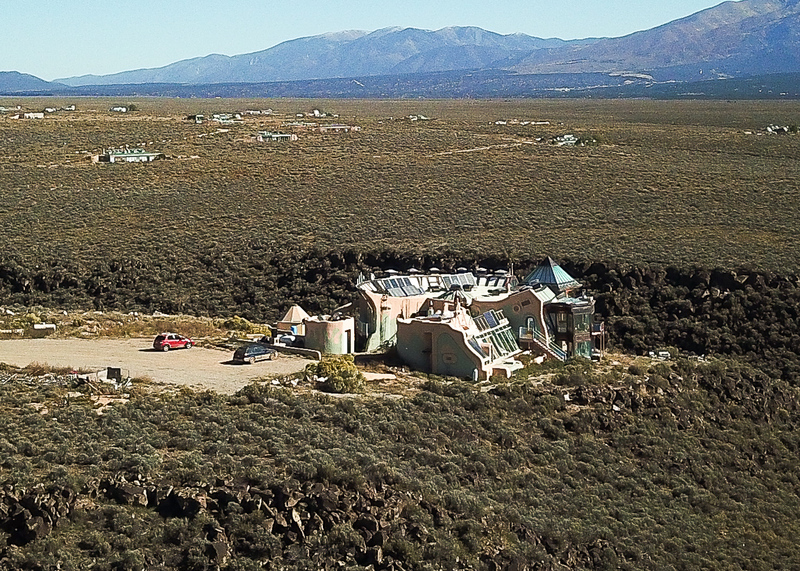 Still on the high desert plain to the northwest of Taos are a group of houses known as “Earthship” houses. These houses are self-contained, self-supporting structures—no public water or electricity. If the world destroyed all public utilities and facilities, these houses and their occupants could carry on as if nothing happened. 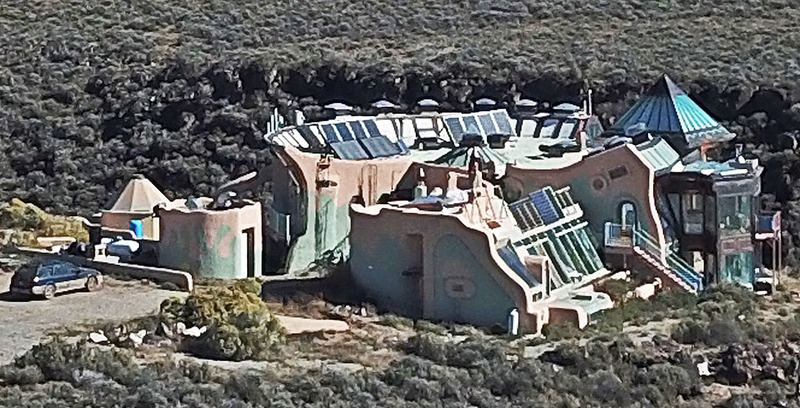 This is one of the more elaborate Earthship houses. Others can be seen in the distance. They attempt to be self-sustaining: catch rainwater/melt snow, grow vegetables in their greenhouse portion of the house year-around, harvest wind and solar energy, passive heat/cool. 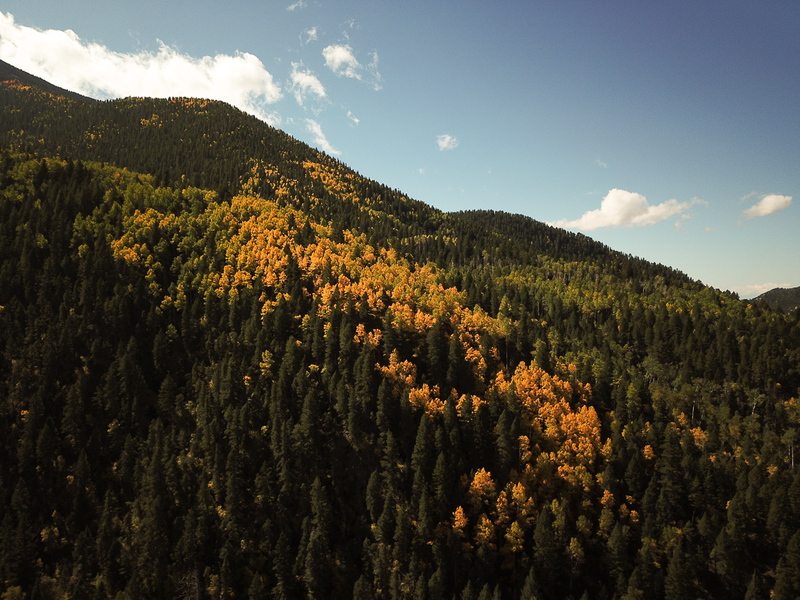 To the north of Taos are the southern Rockies. 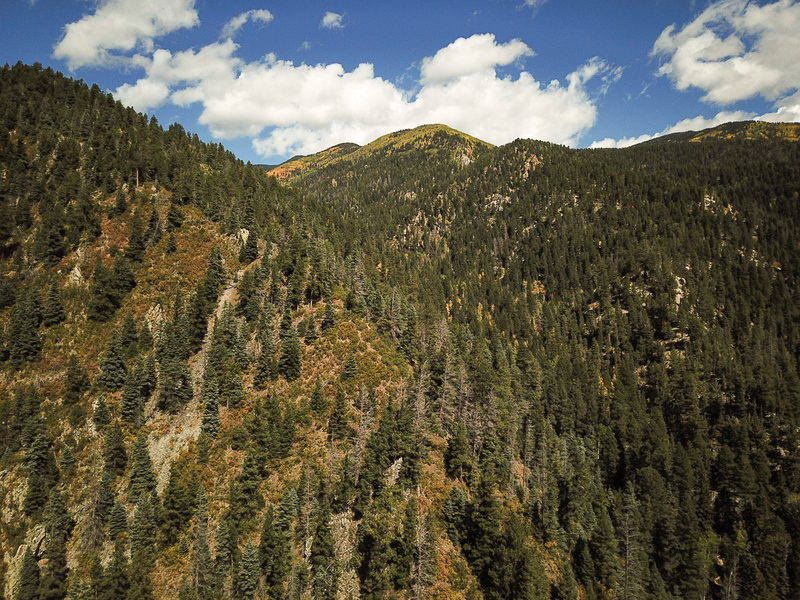 About 15 miles into those mountains is the Taos Ski Valley, an area which is home to a nationally known ski area. This is the house in the area which belongs to of a friend of mine. 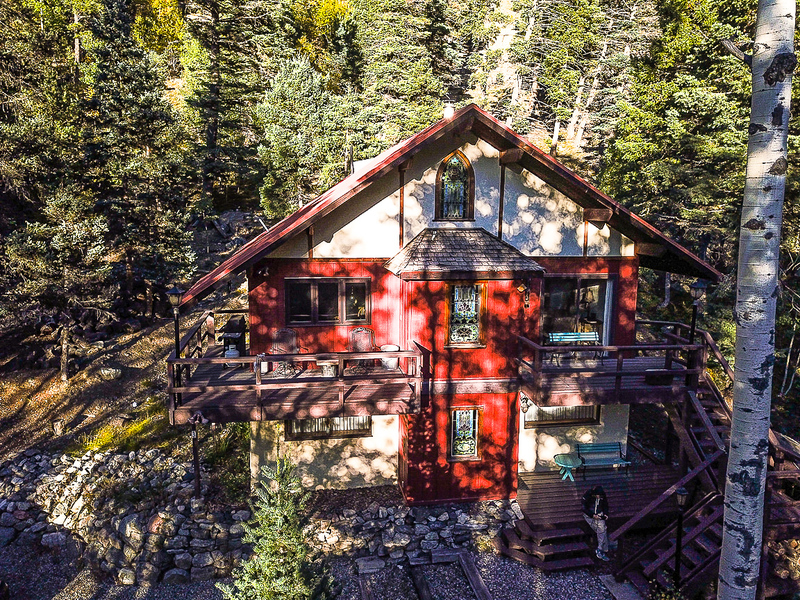 It is at 9600’ and a great place to spend the summer…cool. On the road up to the ski area is an old, but still used cabin. I took all those pictures with my Mavic Pro drone. 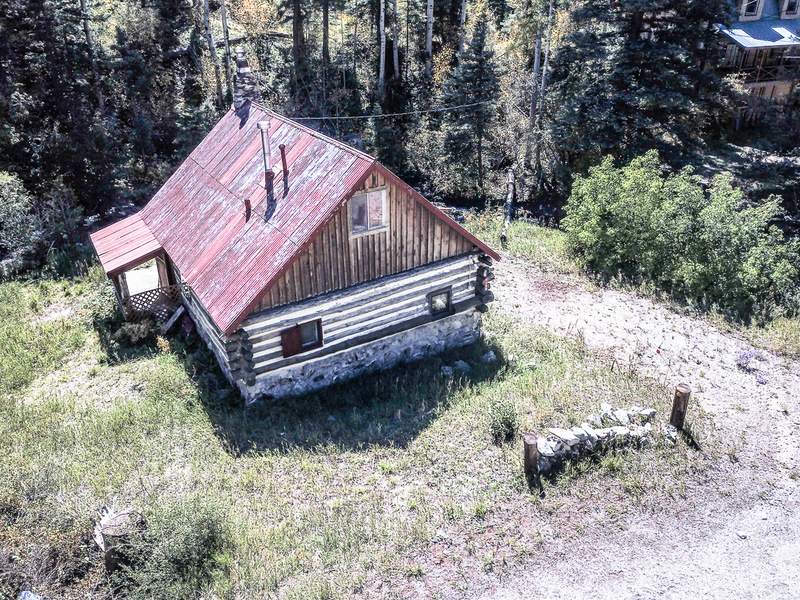 After I took the one of this cabin, I turned the drone to take a picture of the fall colors in the area. You can enjoy the winter if you like to ski, otherwise, perhaps, not so much. Welcome aboard Pneuma and I hope you get as much enjoyment as we have on our Island adventures! We are away at the moment visiting Wilson’s Promontory with the aim of getting to South Point- the most southerly tip of mainland Australia, hopefully in the next couple of days. Reading back through all the old posts is a great way to learn, there is so much useful info buried within this forum. It’s a real shame about the pics disappearing. What transformed sailing for us was adding Haka, spinnaker and outboard, which really help with long distance adventures. Thanks stringy. I'm pretty excited, in fact stoked about the AI ... feel a bit like a kid again ... they have so much potential and scope of use, but you guys already know about that and also the accommodation and transportation stuff. Purchasing the AI sort of overtook me and unlike Jaws, "I think we're doing to need a bigger boat", I've got the bigger boat but not the new front path entry to fit it, and hadn't counted on moving her citrus tree to get to the newly needed addition to the shed for the new secure storage. Oh, and there's the working out the new roof rack system for a pretty challenged low roof max whilst towing the camper without too many $$$. The adult had to return, but almost there and the kids ready to cut loose this weekend. The Prom and the Islands up the coast there are a lovely part of the country and the past few days have been pretty good weather (mind you the Prom can be a weather magnet for scruffy weather). But you must be having a brilliant time and being AI/TI based it's not crowded camping. Any pictures or clips? I guess you have already been on the most eastern point, but the other two could be challenging. Haven't read much about the spinnakers as yet but have seen them on the clips. This will be one of the many further areas to explore. I've been getting a lot of 'education' reading the posts and a bit of salavating watching the clips. Deferred gratification might be over rated! The haka post has been my mainstay and you could say I'm pining for my own haka. You've acknowledged the beauty of the simple wooden haka (well sanded of course) and while I have my name on one of those in the future, for the Murray paddle I have something else in mind. It has been touched on in the haka thread but I don't think I'll let the cat out just yet, and if/when it works out I'll have a post in the haka thread (hopefully) next week. The Prom and the Islands up the coast there are a lovely part of the country and the past few days have been pretty good weather (mind you the Prom can be a weather magnet for scruffy weather). But you must be having a brilliant time and being AI/TI based it's not crowded camping. Any pictures or clips? I guess you have already been on the most eastern point, but the other two could be challenging. We are having a great time Pneuma! We are not camping this time but are doing day trips from a house at Toora, so no its not crowded. So far we have explored the Northern and Southern sections and yes we made it to South Point. I thought we could take advantage of the good weather, though both trips proved challenging, as the actual conditions were worse than predicted. Changes come through much quicker than we are used to at home, but the TI coped well. We made full use of the furlable main, spinnaker, haka and outboard in the strong head, tail and cross winds, then no wind, that we experienced when in the lee of the coastline in certain places. The stability of the TI was great in the confused seas as waves bounced off the rocky coast. Next week we move into a cabin at Tidal River for a few days and hope to do much more exploring of The Prom, weather permitting! Great pictures, Stringy. Keep them coming! Magical place there! Looks like a heavy jacket being worn under the PFD. How are the currents? Thanks Keith and Bob. It is a very impressive and scenic part of Australia and our first visit here. Unfortunately the weather has not been kind for our actual stay at ‘The Prom’. I had hoped to get out today but at 8:30am 53 knot gusts were recorded, which did drop to 41 knots at 12:00pm and were down to 22 knots at 4:00pm ...so went walking instead. The currents can be strong Bob but the Outboard negates them. The water temp is 20C and we were just wearing shirts under our PFD’s. Yes, that kind of wind is definitely walking weather! I’m not much of a fisherman Pneuma, prefer just touring. With only one full day left, after the 50 knot day, and with predictions for the strong winds to continue I thought that was it for our TI adventures. However we woke the next day to much calmer winds and decided on one final trip. Sadly our time at Wilsons Promontary has ended. With so much more still to see we’ll be back. Last edited by stringy on Sat Feb 03, 2018 6:46 pm, edited 1 time in total. Wow! Fantastic pictures Stringy. Amazing! I wonder what the thinking is for formation of Skull Rock?